Have you ever asked yourself if there is a more spiritual way to invite abundance and prosperity into your life? We learned from society that abundance and prosperity, especially money, comes from the outside. We are programmed with limiting beliefs around money and abundance and therefore experience lack. Limiting beliefs are deeply rooted in our unconscious mind and imprinted in our cellular memory. 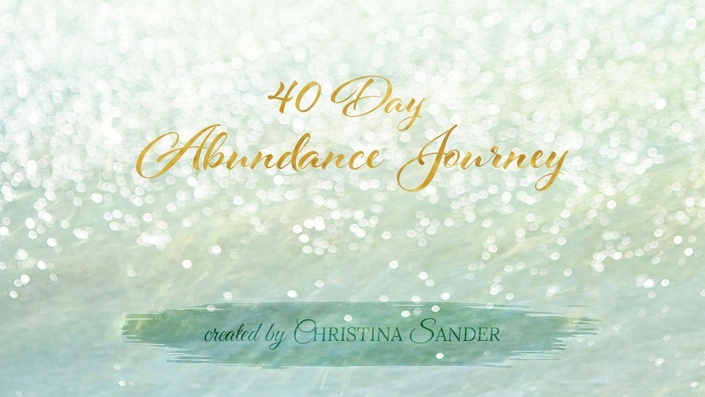 During this 40-Day Journey you will be reconnecting with your soul - the true source of your abundace. You will heal, grow and to align your thoughts, emotions, and actions with abundance and prosperity and create new beliefs that are based on divine truth, love and abundance. Abundance is a feeling that comes from a deep conection to our soul and an innate knowing that we are provided for and taken care of. When we feel abundant we can joyfully go out into the world, live our purpose and shine our light. Are you ready to experience what abundance really means? Christina is a spiritual teacher and gifted intuitive. Her intuitive abilities started to awaken after being introduced to a book about angels at the age of nineteen. Spirituality and metaphysics became Christina's main interest. Christina is trained as an Angel Therapy Practitioner®, a Soul Realignment® Practitioner, as well as an Atlantean Healing Practitioner™, and holds a Master's Degree in Psychology from the University of Zurich, Switzerland. Along with her passion for the spiritual and metaphysical, Christina is an intuitive photographer and designer, and loves to travel the world. Find out more about Christina and her work at www.ChristinaSander.com. What is my next step on my spiritual path?